For food lover, Lori Lyn Narlock, summer begins on the first Saturday of May when Big Ranch Farms begins selling its produce. Just a stone’s throw from Lori’s home, Big Ranch Farms has become the garden she wishes she had, overflowing with ripe tomatoes, a bounty of zucchini and eggplant, a never ending supply of arugula and so much more. 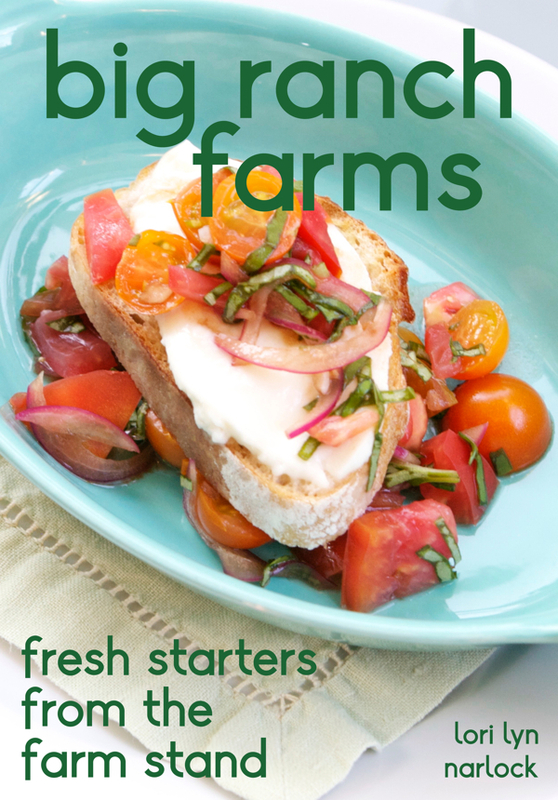 In “Big Ranch Farms: Fresh Starters from the Farm Stand,” Lori offers delicious recipes such as Zucchini Bruschetta, Layered Panzanella and Pan-Roasted Padron Peppers – all inspired by the outstanding produce Big Ranch Farms grows and sells. Lori Lyn Narlock is a busy mom, wife, writer, cook, collector and patented inventor. Her first two ecookbooks are “Super Burgers” and “Summer Smoothies.” Lori is the author of several print cookbooks, including “Small Plates, Perfect Wines,” the “Wine Lover’s Guide to the Best of Napa, Sonoma and Mendocino,” the “Food Lover’s Companion to the Napa Valley” and is the co-author of “smoothies,” “wraps,” and “Cocktail Food.” She is Big Ranch Farms biggest fan.